The Trump administration’s proposal  to repeal the Clean Power Plan (CPP) is based on flawed analysis that understates its benefits. This action is part of this administration’s unfortunate pattern of dismantling sensible policies and rejecting the underlying science of climate change. Repealing the CPP would remove another federal protection meant to help Americans avoid damages from a changing climate. 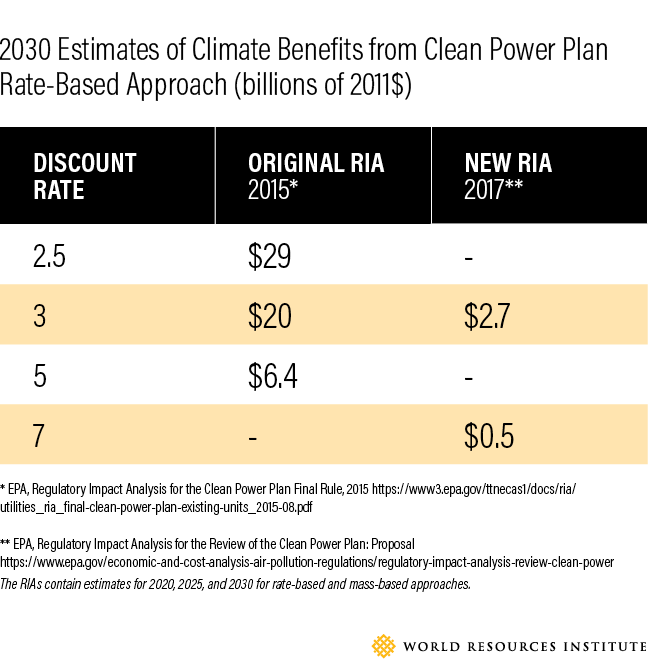 The U.S. Environmental Protection Agency (EPA) seeks to justify the proposed repeal with a new Regulatory Impact Analysis (RIA) that assesses the benefits and costs of the Clean Power Plan. A comparison of the new analysis with the original analysis issued in 2015 under the Obama administration shows the Trump EPA has abandoned mainstream economics in how it estimates the benefits of avoiding climate change. The new cost estimates of those benefits are a fraction of those in the original analysis, as shown in the table below. Science-based climate policies should be consistent with the UNFCCC's objective  to "stabilize greenhouse gas concentrations in the atmosphere at a level that would prevent dangerous anthropogenic interference with the climate system." On the other hand, a benefit-cost analysis, while properly conducted, can inform climate policy, though it should not determine climate policy. Sadly, the new RIA badly misinforms the public on the benefits of protecting our climate. The new RIA contains two major analytical flaws: the first relates to the appropriate geographic scope of the social cost of carbon , an estimate of the damages that result from a ton of carbon dioxide emissions in a given future year. The second relates to how climate-related damages in the future are discounted  to their "present value" and the intergenerational nature of the climate problem. The Trump administration’s analysis adopts a narrow, U.S.-focused view of the social cost of carbon, in contrast with the original 2015 analysis, which took a global perspective. The former is limited to projected climate change damages within the boundaries of the U.S., while the latter takes account of damages projected across the globe. The domestic social carbon cost is roughly 10 percent of the global total. But climate change doesn’t respect geographical boundaries, making its impact felt on all countries, economies and people. The U.S. government has worked for decades with other countries through the UNFCCC and other institutions to address the challenge from a global perspective. If each country considered damages only within its own borders as a justification for action, then collectively, countries would fail to reduce greenhouse gas emissions enough to avoid the global damages that will ultimately affect every country. Both textbook economics and common sense leads to this conclusion, a reality ignored by the EPA’s new analysis. Crucial to calculating the social cost of carbon is the discounting of future benefits and costs to reflect the time value of money. The Trump EPA’s analysis applies the standard discount rates of 3 percent and 7 percent that are commonly used on conventional problems that do not have intergenerational aspects. The higher the discount rate, the lower the value of damage inflicted on people in 2030, 2040, 2050 and beyond. The new analysis ignores the intergenerational impact of climate change and undervalues the damage on future generations. Benefit-cost analysis converts dollar values of future benefits and costs into their present value using discount rates. In other words, a dollar today is worth more than a dollar tomorrow. So a benefit or cost that occurs 30 years from now will have smaller present value than one that occurs five years from now. That makes choosing a discount rate in an analysis of climate policy extremely important, because climate damages stretch far into the future. Longstanding guidance  from the U.S. Office of Management and Budget directs federal agencies to conduct benefit-cost analysis using discounts rates of 3 and 7 percent. However, that guidance also states that lower discount rates – in the 1 to 3 percent range – can be appropriate when there are important intergenerational impacts. The 2015 Obama administration analysis used lower discount rates for precisely that reason and adopted a range of discount rates from 2.5 to 5 percent. Trump’s EPA, on the other hand, used discount rates of 3 and 7 percent, lowering the social cost of carbon and the estimated benefits of avoiding climate change by a factor of 10. The Trump EPA has discarded mainstream economics and common sense by undervaluing the benefits of reducing emissions from the U.S. power sector. EPA has issued a deeply flawed analysis in support of a decidedly wrong turn in U.S. climate policy.